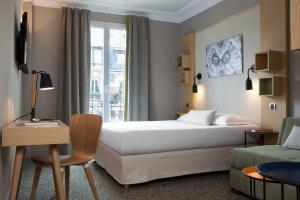 Set in a 20th-century building in central Paris, Chouette Hotel is just 400 metres from Georges Brassens Park. The Porte de Versailles Exhibition Centre is 1.4 km away. It has a 24-hour reception and offers guest rooms with satellite TV. Each soundproofed guest room has a telephone and a private bathroom with a bath or shower. 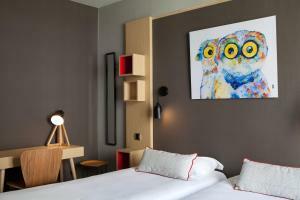 All of the rooms have a colourful décor and are serviced by a lift. A buffet breakfast is served every morning in the breakfast room at Chouette Hotel. Free Wi-Fi access is available in public areas of the Chouette Hotel. 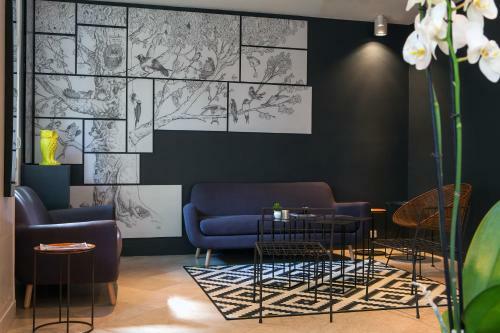 Guests can read the newspapers provided in the lounge area. Convention Metro Station is 400 metres away, providing direct access to the Montparnasse and Montmartre districts. When booking 7 nights or more, please note that the full payment is requested upon reservation. A soundproofed room with an LCD TV and a private bathroom. Rate: € 79.00 ... € 225.00; select dates below to get current rates. Rate: € 98.40 ... € 115.00; select dates below to get current rates. Rate: € 116.10 ... € 126.00; select dates below to get current rates.